Surprise! Another collaboration with a Youtube reviewer. The first by Alex from VapersMD, the Vandy Vape Phobia RDA is a squonk compatible 24mm dripper with a post-less quad terminal build deck and a unique dual centralized airflow system. Designed for single or dual coil configurations, coil leads are installed vertically and easily secured via gold-plated M4 hex screws. Airflow enters the Phobia RDA through dual bottom airslots and is redirected in two different directions to create a cyclonic, direct-to-coil chamber effect. 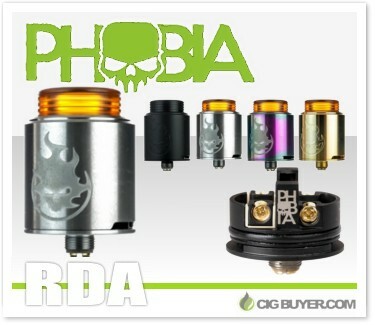 The Phobia RDA comes in several attractive colors and includes an a 810 ultem chuff cap, wide bore 810 ultem drip tip and 510 adapter.